The college basketball season has tipped off and while March is still four months away, it's never too early to look for value in Final Four odds. Duke looks like the clear favorite to win another title but there are a few surprise teams that could also make a deep tournament run come March. The college basketball season has tipped off and while March is still four months away, it's never too early to look for value in Final Four odds. Duke looks like the clear favorite to win another title but there are a few surprise teams that could also make a deep tournament run come March. # Final Four Value Bets *Value bets considered teams with odds greater than 10/1* *Odds courtesy of the Westgate SuperBook* ## Florida State Seminoles __Odds: 15/1__ The Seminoles made a surprise run to the Elite Eight last season. With one of the nation's deepest teams, it won't be as surprising if Florida State makes another deep tournament this year. Seven players that saw at least 13 minutes return for Leonard Hamilton's squad, led by forward Phil Cofer (12.8 PPG, 5.1 RPG) and guard Terance Mann (12.6 PPG, 5.4 RPG, 2.6 APG). Cofer was granted a fifth-year of eligibility and that makes Florida State a dangerous team offensively. The versatile forward is a threat inside or outside and Cofer the player FSU's offense runs through. His return is a huge boost to the Seminoles' chances in March. Guard play will once again be a strength for the Seminoles with Mann and PG Trent Forrest. Mann is shooting a remarkable 57 percent for his career. The offense ranked fourth in the SEC in both field goal percentage (46.8) and effective field goal percentage (53.2) last season. Surprisingly, where the Seminoles need to improve is on the defensive side of the ball. Typically a strength of a Hamilton coached team, Florida State surrendered 73.9 points per game, ranking 12th in the ACC. One would think the defense will improve considering Hamilton emphasizes that side of the ball. The Seminoles play in the killer ACC, so they'll probably finish in the fourth-to-sixth range during the regular season. Don't sleep on this team in March though. As they showed last year, the Seminoles possess the depth and style to give other teams fits in the tournament. ## Mississippi State Bulldogs __Odds: 20/1__ The SEC is known for football but the conference is loaded in basketball this year as well. Kentucky, Auburn and Tennessee are all legitimate Final Four teams with odds at 8/1 or lower. Right behind them though sits a dangerous Mississippi State team that could cause havoc in March. The Bulldogs return all five starters from last year's NIT team to go along with a top-20 recruiting class. Mississippi State will once again be led by its defense. The Bulldogs ranked third in the SEC in scoring defense last season at 67.8 points per game and they should be even stingier this year. The Bulldogs are an athletic team led by the Weatherspoon brothers (Quinndary and Nick) at guard and versatile forward Aric Holman, who averaged 10.9 points and 6.7 rebounds per game last season. One area Mississippi State needs to improve in to make a deep tournament run is three-point shooting. The Bulldogs ranked 12th in the SEC shooting the three last year at just 31.9 percent. Still, this is one of the most athletic, experienced team in the SEC. If the Bulldogs can improve their three-point shooting to go along with a stifling defense, they'll be a tough out in March. __Read more:__ [Updated Heisman Trophy odds](https://www.betchicago.com/tua-tagovailoa-heisman-odds-alabama) ## Nebraska Cornhuskers __Odds: 40/1__ The team I'm all over this season is Nebraska. The Cornhuskers are my favorite play at 40/1 to make a Final Four run. The Cornhuskers return 79 percent of their scoring, 73 percent of their rebounding and 75 percent of their assists from last season's 22-win team. Nebraska's top four scorers return led by guards James Palmer Jr. (17.2) and Isaac Copeland Jr. (12.9). The Cornhuskers aren't big in the frontcourt, although Nebraska rebounds well thanks to their guards. Palmer and Copeland combined for over 10 boards a game last season to help Nebraska post the 15th highest offensive rebounding rate in the country. The Huskers also have an experienced point guard in Glynn Watson Jr. (10.5 PPG, 3.3 APG) to lead the offense. Nebraska needs to improve its three-point shooting that ranked ninth in the Big Ten (34.6%) but the Cornhuskers are an experienced, guard-oriented team that has the ingredients to make a deep run in March. Nebraska opened at 75/1 and is down to 40/1 to reach the Final Four. That's still good value for a team I expect to compete for a Big Ten title this year. ## Buffalo Bulls __Odds: 60/1__ Looking for this year's Loyola? It very well could be the Bulls. Buffalo is one of the most talented mid-major teams in the country and returns its top three scorers from the squad that blew Arizona out of the gym in the first-round of the NCAA Tournament. Buffalo will be a nightmare matchup for the bigger schools come March because the Bulls are quick, athletic and experienced. They have all the makings of a team that can make a Cinderella run to the Final Four. Guard CJ Massinburg is the favorite to be MAC Player of the Year after scoring 17 points and grabbing seven rebounds per game a year ago. He's joined by forwards Jeremy Harris (15.5 PPG, 5.9 RPG) and Nick Perkins. All three players can shoot the ball well with Massinburg (89) and Harris (92) combining for 181 three-pointers last year. The only issue facing Buffalo entering the season is at point guard, where all-conference selection Wes Clark must be replaced. Clark was the driving force behind the Bulls' fast-paced offensive attack. 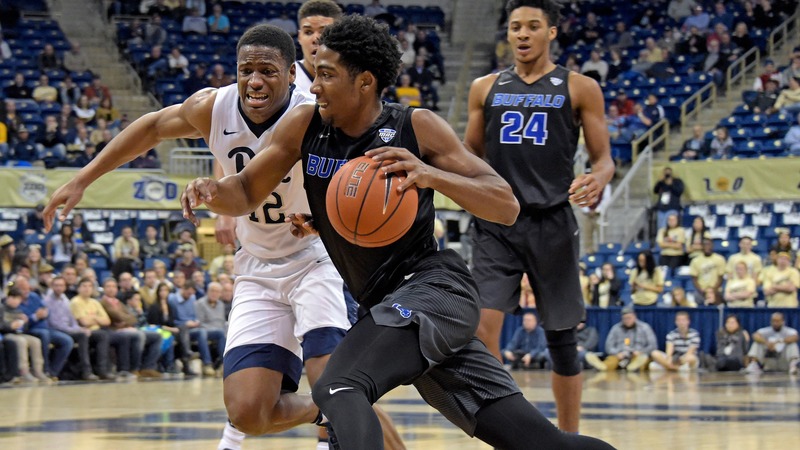 If head coach Nate Oats can find a competent point guard, Buffalo will once again be a threat in March. Buffalo opened at 200/1 to reach the Final Four and is down to 60/1. For a mid-major team, the Bulls have the talent and experience to make a magical Loyola-type run to the Final Four. Don't expect to get 60/1 odds in March. Buffalo will be a popular pick to make a deep tournament run this year.